Eons ago, tremendous geologic upheavals formed a giant dome of rock - a "swell" in the earth's surface. The harsh elements beat against this dome and eroded it into a wild, broken array of multi-colored sandstone. Wind and water carved this jumble of rock into incredible formations as buttes, canyons, pinnacles and mesas emerged, making the Swell one of the most ruggedly beautiful pockets of terrain in the world. 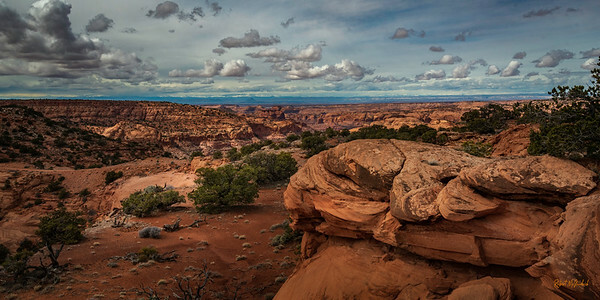 That was how this area came to be known as San Rafael Swell. 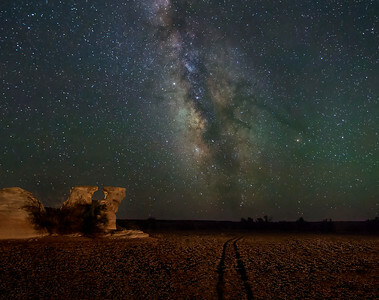 The Milky Way Galaxy stretches across the desert sky of the San Rafael. Ading to the beauty of this beautiful Utah scenery. 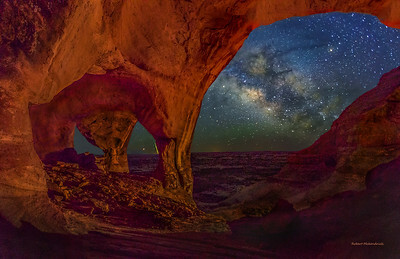 This is a strange and colorful valley, which is unlike any other in Utah. The landscape, covered with sandstone goblins and formations, is often compared to Mars. Explore the geology, and camp among the nooks and gnomes. This is the east side of the park. The goblins hang out Just to the west of this sandstone wall. The snow capped Henry Mountains give a majestic back drop to the park. 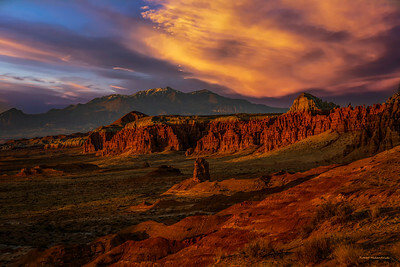 Molly's Castle is locate just outside Goblin Valley State Park In Utah. This area is a Bortel 1 classified Dark sky. This is the top rating for dark skies.The Bortle scale is a nine-level numeric scale that measures the night sky's brightness of a particular location. It quantifies the astronomical observability of celestial objects and the interference caused by light pollution. John E. Bortle created the scale and published it in the February 2001 edition of Sky & Telescope magazine to help amateur astronomers evaluate the darkness of an observing site, and secondarily, to compare the darkness of observing sites. The scale ranges from Class 1, the darkest skies available on Earth, through Class 9, inner-city skies. The wonders of our galaxy. First you have the beauty of the milky way in the night sky. 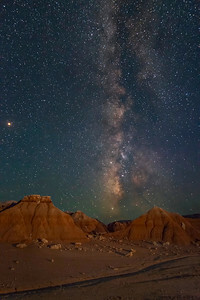 Then you are looking at the stars from the milky way in the dark skies of the San Rafael Reef, a geological wonder. 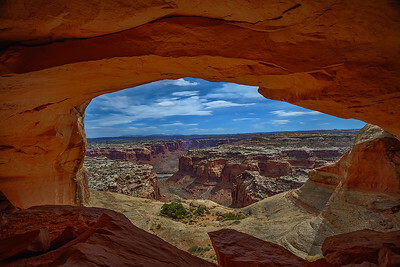 In the San Rafael is the amazing arch looking over Canyonlands National Park. 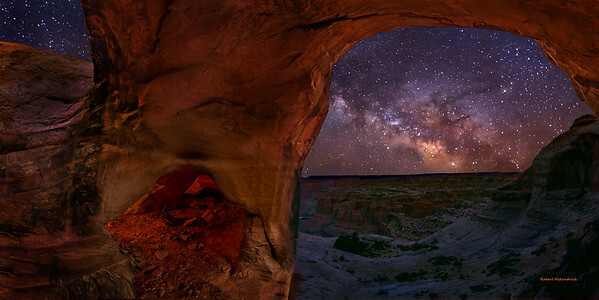 Framed in the center arch is the planet Mars. If this is not enough there is a shooting star to the right of Mars just inside the arch. If the shooting star would have been just a little more to the right it would have been missed. The haze on the horizon of the sky is from a local forest fire and I believe it also gave the falling star the yellow color. The view from a hidden arch in the San Rafael Desert. 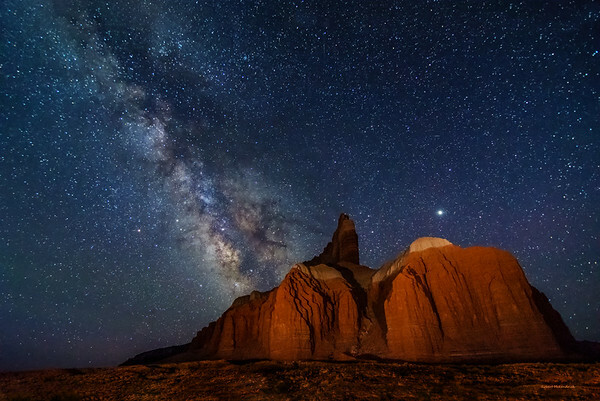 The dark skies of southern and central Utah give such an opportunity for star gazing. 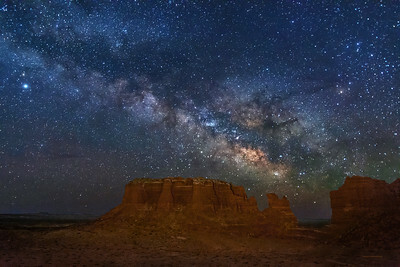 The Milky Way Galaxy and Jupiter rising over Horse Butte at Goblin Valley State Park. 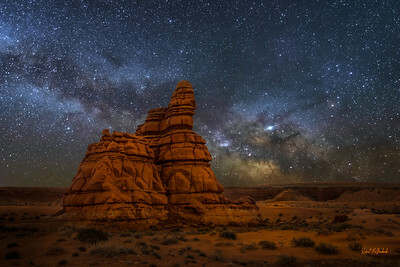 Utah has some of the Darkest skies in the world and Goblin Valley is a certified dark sky area. No better place to star gaze. 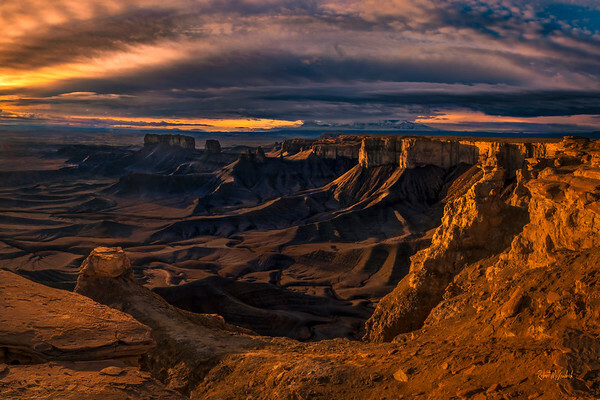 For years the San Rafael Swell has been considered one of the undiscovered natural wonders of the American West. 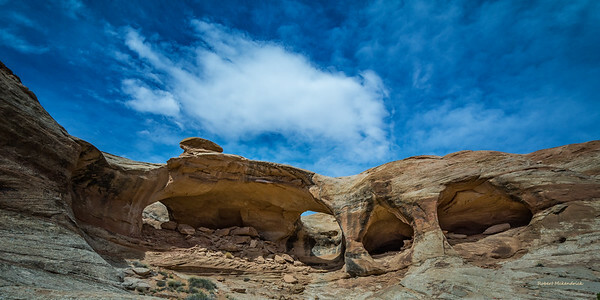 Managed by the Bureau of Land Management; the Swell offers visitors many of the same sights that can be seen in several of Utah's national parks but allows these visitors to enjoy these sights in leisurely solitude. The San Rafael Swell also provides sights that cannot be found anywhere else; such as Goblin Valley and the San Rafael Reef. Hiking possibilities here range from easy to strenuous technical canyoneering. The Buckhorn Draw section of the San Rafael Swell is a pretty area of steep canyons. It is located in the northern section of the Swell, north of I-70. There are several great attractions in or near it, including The Wedge Overlook, the San Rafael Bridge and the Buckhorn Wash Pictograph panel. The scenic drives leading to it travel through more rolling country dotted with junipers. 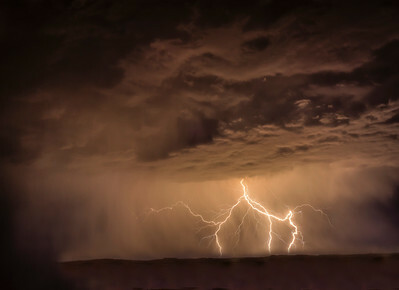 The dark skies of the San Rafael Desert lead to beautiful experiences. 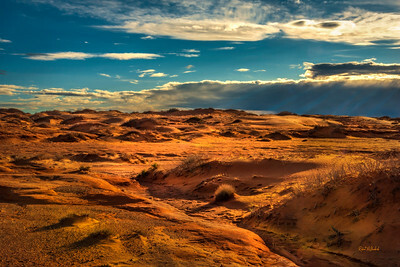 Add the awe inspiring landscape of the San Rafael Desert and you have a mystical force of nature. 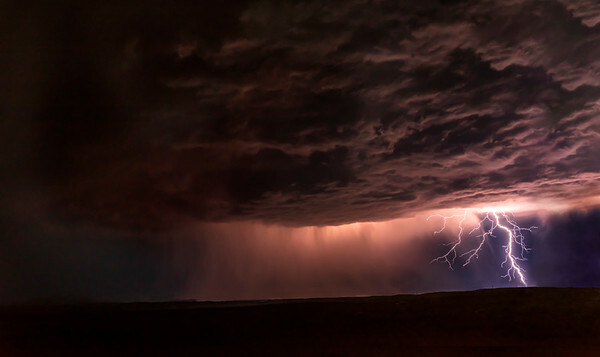 A thunder storm rolled through Castle County Last night. 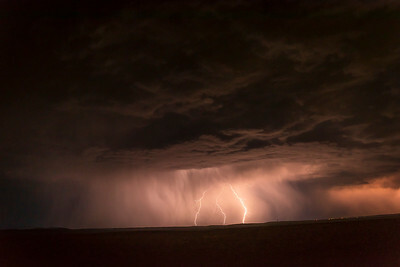 As it rolled through the San Rafael Desert and moved across the swell I was able to capture a few shots. Near the infamous Robbers Roost. 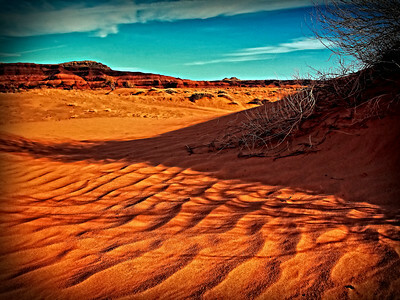 The area around Robbers Roost has little water and a tremendous amount of desert. Harsh but beautiful country Contact "Hanksville Tours" for information about this area. Near the infamous Robbers Roost. This is one of the canyons in the roost area. Imagine a posse trying to follow an outlaw through this country. Contact "Hanksville Tours" for information about this area. Sometimes you come across a view that just blows your mind. You could fly to the moon and quite possibly not see something that looks so “Moon-like” as you will see here. Wayne County is know for its terrain that looks extraterrestrial and this view doesn't disappoint.